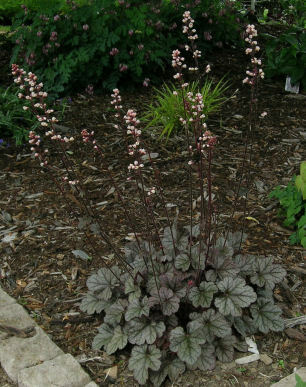 HEUCHERA—The coralbells and alumroots are an American genus with handsome clumps of evergreen basal foliage and graceful spikes of small bell-like flowers in late spring to late summer. The taller types can be very effective in large groupings, which in bloom have a misty, ethereal quality. The smaller types are best used in raised beds, rock gardens, or containers and have a subtle, refined beauty shared by few other plants. 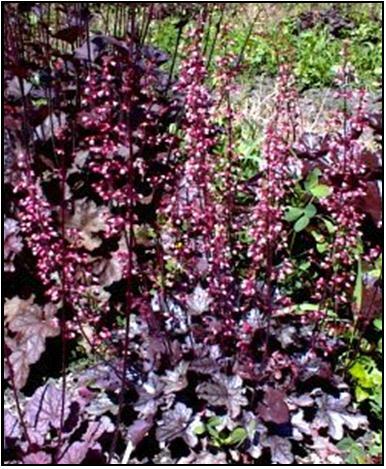 Some heucheras have foliage that is red to purple and may be marked with silver; this is most pronounced during the cool months of the year and may fade somewhat in the heat of summer. The newer selections and hybrids are spectacular foliage plants, easily the equal of any other perennial in this regard. The best of the new varieties are worth growing for their flowers, as well. 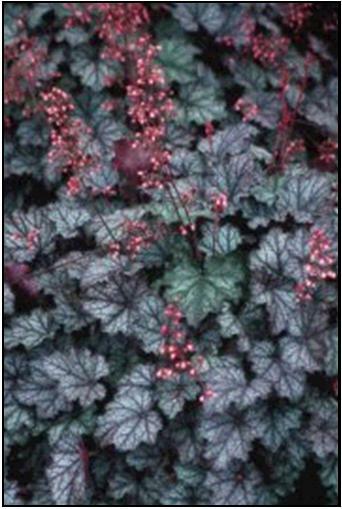 In general heucheras want light shade to part sun (the foliage of most forms will burn in mid-summer in full, hot sun, especially if the soil is dry) and well-drained soil. Most of our varieties are based ultimately on the hybrid ‘Montrose Ruby,’ a cross between H. americana ‘Dale’s Strain’ and H. villosa ‘Palace Purple’ produced by Montrose Nursery in the 1980s, on the one hand, and our own crosses between the garden H. brizoides and H. pubescens, a large-flowered eastern native, on the other. ‘Montrose Ruby’ has contributed wonderful burgundy coloration and ‘Dale’s Strain’ silvery foliage and vigor. H. brizoides has given showy flower colors and H. pubescens large flower size and drought and cold tolerance. 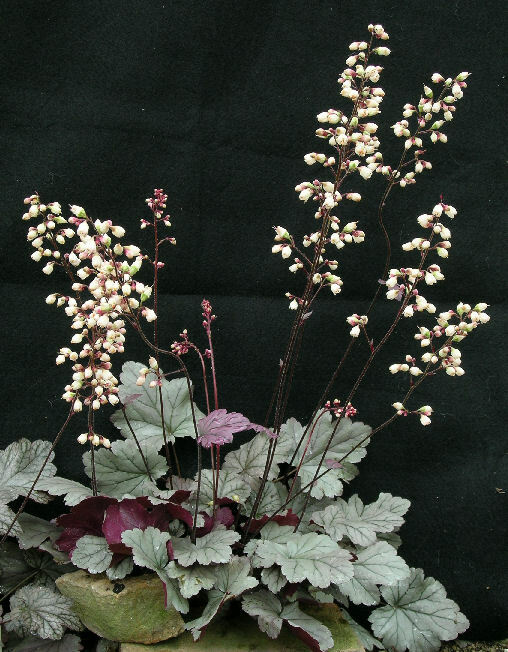 One of our hybrid series, the Petites, has been developed using two small western montane species, H. hallii and H. pulchella, crossed with larger burgundy and silver leaved forms. 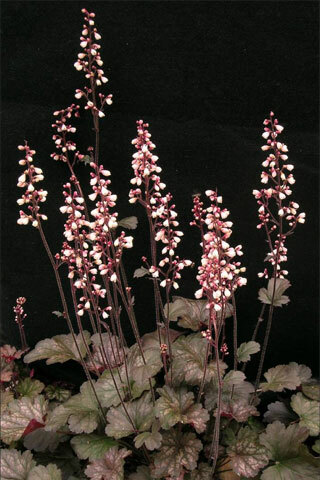 Read more about Heuchera on our Featured Plants pages. Suggestions for use follow the discussions in our book. Clicking on the FP symbol next to the descriptive text will open the variety's Featured Plant page in a new window. 'Caroline' (PP# 20,026) is a special favorite of ours and is named after our grand-daughter. 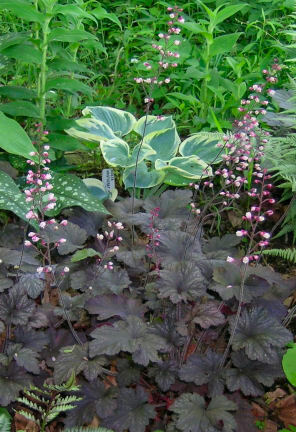 The foliage grows in a compact, dense mound about 8" high X 12" wide. The leaves are slightly ruffled, soft warm mocha color (less green than in the photo), with an overlay of silver. The undersides of the leaves are red-purple. Flower stems are erect to 18". Flowers are relatively large and creamy white, opening from dark pink buds. Bloom time is May to June. 'Caroline' has a pleasing balance of proportions of flower size, height, and leaf size, and a very good matching of flower to leaf coloration. 'Coral Bouquet' - This is our hybrid between the western H. cylindrica and the garden H. brizoides. 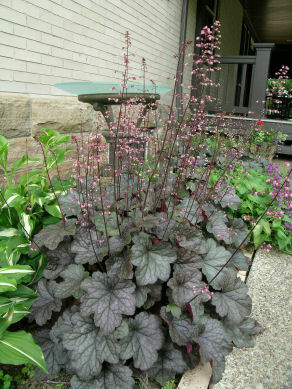 This has probably the largest, showiest flowers of any heuchera on the market. They are shrimp pink and borne in full cattail-shaped inflorescences. The green leaves have some silver patterning. ‘Coral Bouquet’ will do better with nearly full sun and especially good drainage and air circulation.18-24”. Best for rock garden or raised bed use. Best for container and perennial border use. 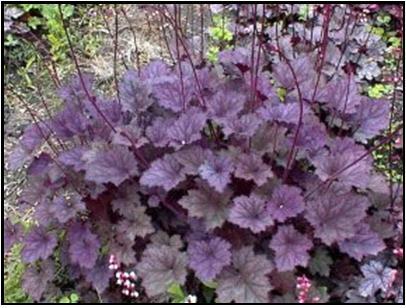 There is an excellent description of this plant on the Garden Splendor website. This includes a discussion with David Wilson on the radio program The Paul Parent Garden Club. Best for perennial border use. Best for containers and raised beds. 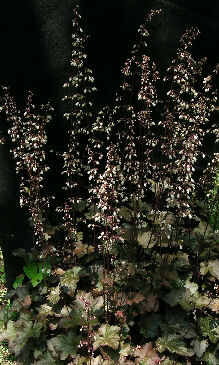 'Moonlight' (PP#17,434) was introduced in 2008 through Monrovia Nurseries. The growth habit is a loose tuft about 8" high X 12" wide. 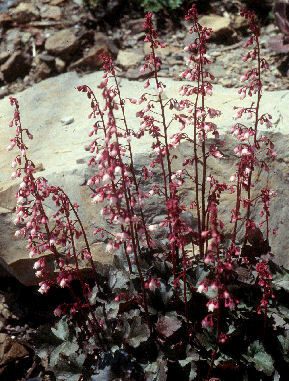 The flower stems are erect and about 18" tall. 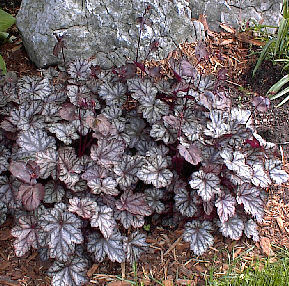 The leaves are about 3.5" wide and dark bronze-purple with silver markings. The undersides are dark red-purple. The flowers are very large and pale green. 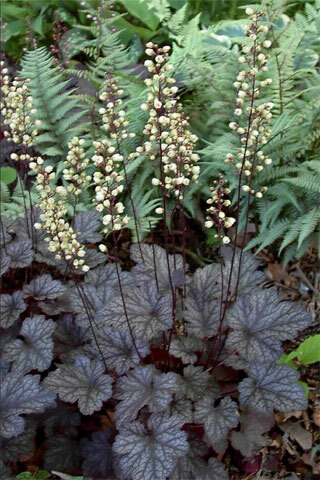 The flower stems are contrasting dark purple, making a very pleasing contrast with the flowers. Bloomtime is May into June. This plant in bloom has a mysterious quality. The flower color goes nicely with pale green foliage like that of Japanese Painted Fern. 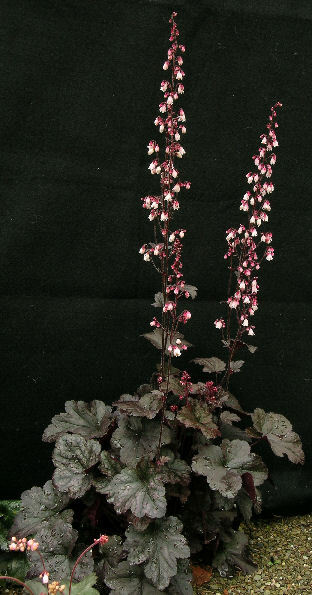 'Petite Pearl Fairy' (PP#11,058) – Small bronze leaves marbled with silver, medium pink flowers on 10” stalks. 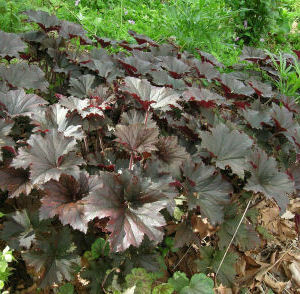 The plant in the photo is grown under garden conditions of lean soil and full sun. Best for perennial border and raised bed use. 'Quilters' Joy' - Crisply defined silver markings on a bronze background make this selection look like patchwork. 'Quilters' Joy' has white flowers on 18-24” stems in late spring. We suggest combining this with Penstemon digitalis 'Husker Red'. 'Quilters' Joy was given an Award of Garden Merit in 2002 in the RHS Wisley trials. Best for border and raised bed use. Excellent for container and raised bed use. Best for perennial borders and mass plantings. 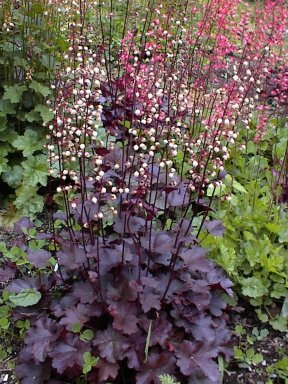 villosa f. purpurea ‘Bronze Wave’ - This dark-leaved form is the largest of the heucheras we grow. The wavy-margined hairy leaves are 6 to 8” across and make a clump about 24” across and 18” high. 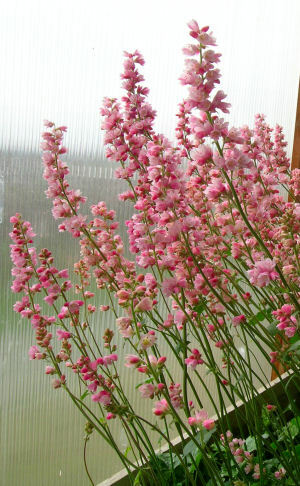 24” wands of pinkish-white flowers are produced from mid to late summer. The plants we offer are a clone selected for vigor, habit, leaf shape, and retention of good foliage color through the season. Best for perennial border and naturalizing.